Anti-Wear Hydraulic Oil (also known as AW hydraulic oil) prevents wear in hydraulic system pumps as well as carry away heat and debris from vital system components. AW hydraulic fluid is offered in a multitude of viscosity grades as well as varying quality levels and additive make-up. Although the concept of hydraulic systems is very basic, the type of hydraulic fluid needed is not. Hydraulic Systems operate in varying climates and conditions requiring very specific fluids in order to maintain proper operation and longevity. Vane, Piston, or Gear-type pumps where pressures can exceed 1,000 psi. 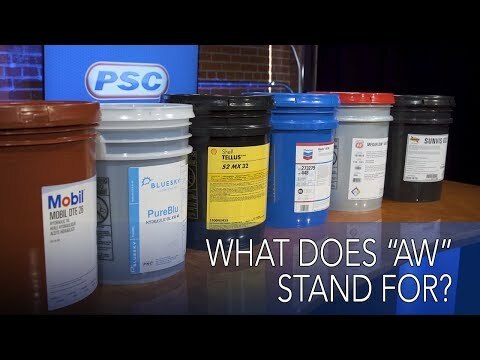 These are just some of the applications an anti-wear hydraulic oil can be used for. Note that both base oil quality and additive quantity greatly affect the characteristics of these lubricants. Refer to the product data sheets on the individual product pages for recommended applications, product specifications, and key performance characteristics including Viscosity Index, Pour Point, Demulsibility, Oxidation Stability (TOST) test, and ZDDP levels. Read more: What Does AW Stand For? *NOTE: For best results, refer to your system's manufacturer specifications and approvals.